Q. Is Plaque Attack® safe for my pet? A. Yes! All the ingredients in both products are 100% natural with the main ingredient being grapefruit seed extract making them safe for all breeds of cats and dogs. A. The ingredients mix with your pet's saliva when applied on your pet's teeth and completely coats your pet's teeth and mouth. This process kills harmful bacteria and loosens plaque and tartar. Q. How long will it take for my pet's teeth to be white? A. The results with your pet will depend on how closely you follow the directions, the age of your pet, and the current condition of your pet's teeth. You should notice a disappearance of tartar and plaque between the tooth and the gum line and a reduction in redness within the first few weeks of application. If there is a large build-up of plaque the last area that will disappear is toward the center of the tooth. You can accelerate the results by spraying during the day and swiping the gel at night. The spray and gel both loosen the plaque and will dissolve it over time. The natural motion of the pet chewing will remove the top loose layer until the layers are gone. You can speed the results by brushing after a minimum period of daily usage (two-three weeks minimum for heavy tartar). Lastly, you can do as some of our testimonials have- use their finger nail to remove the softened tartar after 30 days! Admittedly, it is not too appetizing, but you will see the effectiveness for yourself! Q. What is Plaque/Tartar and how long does it take to form? A. Plaque formation begins immediately after a tooth surface is cleaned. It takes about 4 to 9 days (average 7 days) for plaque to become fully mature! So- be consistent with Plaque Attack and it won't have an opportunity to form! Dental plaque once formed remains viable unless it is removed from the tooth surface. While multiplication and growth of bacteria keep the plaque viable, the dead bacteria form a loose, whitish film on the surface of the plaque. This loose, easily removable (by brushing) material contains mostly dead bacteria and desquamated epithelial cells. Dental plaque may undergo calcification (deposition of calcium salts) and become hard. This is then known as tartar (or hardened dental calculus). Dental plaque forms again on tartar which may undergo calcification and forms further tartar. Thus tartar usually forms in layers and usually remains covered by dental plaque. The neat thing about Plaque Attack is that this all-natural formulation works without needing a dental pick! Most people brush once or twice daily but still go to the dentist twice a year to have their teeth scaled (tartar and plaque removed)! So, even if you brush their teeth everyday, you still may need to put them under for a scaling! 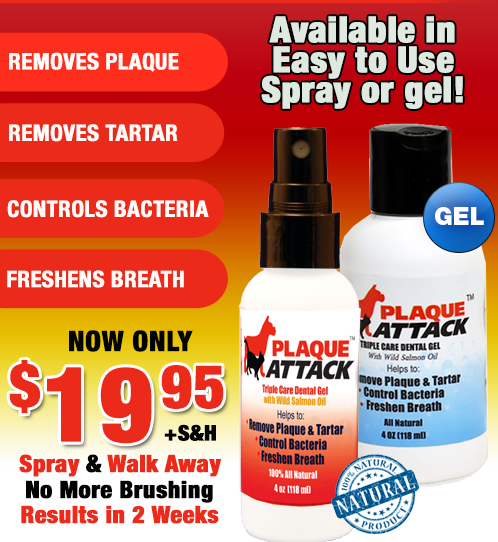 Use Plaque Attack and you will notice a dramatic improvement- spray, swipe and smile! Q. Why do you have a gel and a spray formulation? Both products have the same active ingredients but the method of application is different. The gel has a gelling agent which helps to coat the teeth better- you simply swipe and you are done. For pets coming to us with heavy plaque and tartar, we have found that a Spray/Swipe regimen gets the fastest results. 30-60 days works for the spray only but the spraying in the morning and swiping the gel right before bedtime gets results much faster! When you order on this site, you will have the opportunity to buy the gel at a special price in addition to your Plaque Attack spray order! If you only want the gel, please call 1-800-536-5327 or email customer service (service@sellontv.com) to place an order. Q. My pet has bad breath will these products help? A. Yes! In most cases bad breath (halitosis) is caused by bacteria living in your pet's mouth. Both the Plaque Attack spray and gels are specially formulated to kill bacteria on contact, so as your pet's mouth becomes healthier breath becomes fresher. A. None that are permanent. There may be a temporary one, however. If your pet is extremely sensitive to changes in his or her diet and may have loose stools as a result, Plaque Attack may upset their stomach. In that case, reduce the dosage (e.g. one spray per day) from the bottle for four or five days and gradually increase the sprays to the quantity recommended on the bottle for your pet's weight. Gradually introducing the Plaque Attack will give your pet the chance to adapt to the addition and should be trouble free from then on. The only other "side effect" you will notice is that your pet will lick their lips repeatedly after you spray (or swipe the gel). This natural reaction helps coat your pet's teeth and gums. Q. I just had my pet's teeth cleaned why should I use anything else? A. Plaque can form in as little as seven days! Using the recommended maintenance dosages, the plaque will stay away and the Plaque Attack spray and gel will last a good long time! Q. What is the guarantee? A. EPI has a 45-day money-back guarantee for the product price if you are not satisfied and when you return the unused portion (if you buy multiple bottles, only open one as we refund only one open bottle per order). What we recommend is that you take a before picture of your pet's teeth, take another picture after 30 days and another after 60 days then e-mail us the results at service@sellontv.com You and your pet could be featured on our testimonial page! Q. Will I save money by using them? A. Yes! Medical costs of all sorts are rising at an alarming rate. Prevention is normally much cheaper- with Plaque Attack, it actually helps cure AND prevent- for the same price! If they save you only one dental cleaning, you are ahead- all the while your dog's breath was better! Q. How long will the bottle last? A. Our TV offer is for up to 6 month supply which ships in a 2.2 oz bottle containing over 450 sprays. For a dog up to 12 pounds (medium to heavy tartar), spraying three sprays twice a day for the first month, then three sprays a day for one month and maintenance mode (once a day, 3 times per week)- the bottle will last seven months. We rounded down to six months for our claim for that sized dog. So your dog's weight and condition of the teeth determine how long it will last. If your dog's teeth are bad, the first bottle will last much shorter than all subsequent bottles due to the fact that the directions call for multiple applications per day until the teeth are clean and only two or three applications per week in maintenance mode.